Roberto Manuel Hernandez was born on November 11, 1964 in Santurce, Puerto Rico. The six foot four right-hander, grew up in New England & attended high school in New Hampshire. From there he went to the University of Connecticut as well as the University of South Carolina, Aiken. He was selected in the first round of the 1986 draft (the 16th pick overall) by the California Angels. In 1989 he was traded to the Chicago White Sox organization for Mark Davis. 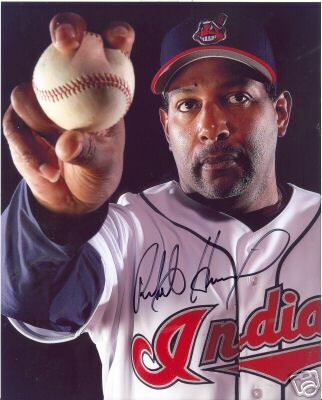 In the minor leagues he was mostly a starting pitcher, winning 11 games between AA & AAA in 1990. After going 4-1 at AAA Vancouver he got to the big leagues as a September 19991 call up. 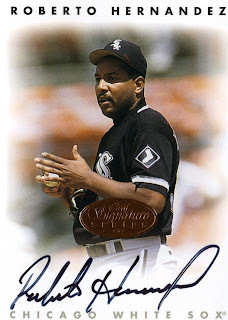 By 1992 he was in the White Sox bullpen going 7-3 with 12 saves, taking over the closer role from Bobby Thigpen. In the 1993 White Sox AL Western Division winning season he saved 38 games (4th in the AL) posting a 2.29 ERA, while striking out 71 batters in 78 innings pitched. Post Season: In the ALCS against the Toronto Blue Jays he appeared in four games earning the save in Game #4 at Toronto's Sky dome. He would pitch for the White Sox through 1996, saving over thirty game two more times, while leading the league in games finished three straight years. After going 5-1 with 27 saves by July 31, 1997, he was traded along with Wilson Alvarez and Danny Darwin to the San Francisco Giants for Keith Foulke & five other players. He finished the year out as a set up man to Rod Beck with the Giants, winning the NL West. He making three appearances in the NLDS against the Florida Marlins. He then signed on with the Tampa Rays getting a closer role once again for 1998. He spent three years in Tampa, having a fantastic year in 1999 saving a career high 43 games (second in the AL). He led the league in games finished (66) going 2-3 with a 3.07 ERA. 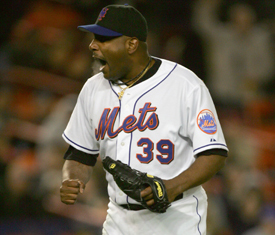 He then went to the Kansas City Royals for two years as their closer saving over 25 games each season. By 2003 he was closing in on age forty & his closer days were behind him. 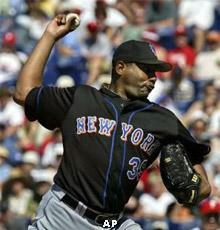 He then became a mid reliever for the Atlanta Braves (2003)& the Philadelphia Phillies (2004). In 2005 he was signed by the New York Mets, and was used along with Aaron Heilman as a set man for Braden Looper. He made his Mets debut in the second game of the season in Cincinnati striking out three Reds in 1.1 innings of work in a Met loss. The forty year old Hernandez had a fine year in the Mets bullpen, going 8-6 saving four games & getting credit for 19 holds. He led the staff with a 2.58 ERA & a team best, 67 appearances. He struck out 61 batters walking 28 in 69.2 innings of work. For 2006 he signed with the Pittsburgh Pirates where he expected to compete for the closing role once again. But after 46 games, and three saves he was 0-3 & found himself back in New York in a trade. It happened when the Mets Duaner Sanchez went down for the season after being involved in a car accident in Miami. Hernandez came to the Mets along with Oliver Perez in exchange for Xavier Nady. 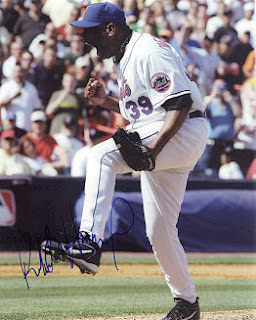 He returned to the mound in a Mets uniform on August 2nd in South Florida getting credit for a hold against the Marlins. In that game he allowed two runs in one inning of work. He would get credit for three holds the rest of the way, all coming in the month of August. 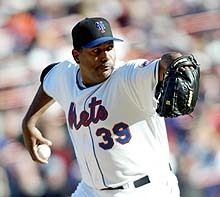 In 22 appearances with the Mets he posted a 3.48 ERA striking out 15 batters in 20 innings of work. Post Season: He did not appear in the NLDS but made three appearances in the NLCS against the St. Louis Cardinals, pitching 2.2 innings of shut out ball. In 2007 he signed with the Cleveland Indians going 3-1 before getting released in late June. He signed with the Los Angeles Dodgers and finished out his 17 season career there at age 42. In 1010 appearances (13th all time) he posted 326 saves (13th all time) finishing 667 games (9th all time) going 67-71 with 945 strike outs 462 & walks in 1071 innings of work.